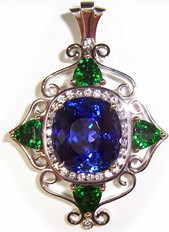 We are the discoverers of Tsavorite and specialists in all African coloured gems. Our family has been in Eastern Africa since the genesis of coloured gemstone mining and was instrumental in the introduction of Tanzanite to the world market. Our company is vertically integrated from the mine to the finished product. This integration is especially important in today’s gem and jewellery market, as the recent implementation of the U.S. Patriot Act requires gem dealers to perform due diligence to ensure the legitimacy of their suppliers. Through decades of mining, we have developed responsible mining practices and built bonafide relationships with other miners and gem dealers, in an effort to maintain the integrity of mining African gemstones. Our extensive inventory originates from our mines or has been bought on-site from other trusted sources. We then perform every process in-house, including grading and cutting in our local facilities. Thus, we are 100% confident in the origin and quality of each stone. Our inventory includes the following extremely fine gemstones: Tsavorite, Tanzanite, Garnet (all varieties), Tourmaline (all colours), Aquamarine, Sapphire (all colours), Ruby, Spinel (all colours), Opal, etc.